Let’s talk holidays. If you didn’t know it I’ve just returned from a week away in the beautiful Singapore (more on one facet of the destination here). E and I had an absolute ball, but before we get into holiday details let’s discuss the pre-vacay stuff. One major thing to consider when traveling is packing (of course). Obviously you don’t want to forget anything, but you also need to consider fabrics that are not going to crease and require little ironing once you’ve arrived at your destination. Nobody wants to spend precious exploration time slaving over an ironing board, and that is why I was ecstatic when a package arrived on my door step a few days before we left on our trip! Said package contained what one can describe as a dress you just need in your wardrobe for more than one reason. Meet new Aussie label Little Tanning Dress! As the name implies the Queensland label creates comfortable, affordable and fashionable garments designed to be worn post fake tanning. Their collection of dresses and jumpsuits are made of a crinkle free polyester and spandex blend that is silky on your skin and won’t take off your fresh tan. We lead busy lives and this dress basically saves time if you’re a tanned goddess – no need to wait around for your glow to dry with this baby, just pop it on and continue on your way. Genius right! I’ll admit I don’t feel the need to fake tan very often but what I love about the dress is it is perfect for travel, due to the crease free fabric. Although the product is predominantly marketed towards the fake tan queens in the crowd, take my advice, this dress will be your best friend if you spend a lot of time living out of a suitcase, or on the road. And I guess if you wanted to fake tan then jump on a flight you could with Little Tanning Dress! Of course I packed my new “Ellie” dress on our recent trip overseas. It was meant to be! The reason I chose this beauty was I knew it’d be perfect for holidays as the simple LBD style can be dressed up and down to suit my mood. Fabric wise, the dress just slides on! It’s silky and soft and the cool part is most of the labels dresses are free size. Every kind of lady can join the party! The relaxed bohemian fit and style is very on trend right now, and the garment just flows over my curves, which is especially good on holiday because of course you spend a lot of time eating all the new foods! I also love the sleeve details, which add another element to the look, and can be tied in a few different ways, or left loose, depending on your mood. I feel glamourous and expensive, but all in all happy and comfortable, which is how you want to feel on holiday. Accessories wise you can wear pretty much anything you like with a LBD. I went with a chunky, bright statement necklace to compliment the plunging neckline. Any colour would work but I loved how the blue and green stood out against the black. A great pair of statement earrings would also work, as the dress speaks for itself really! 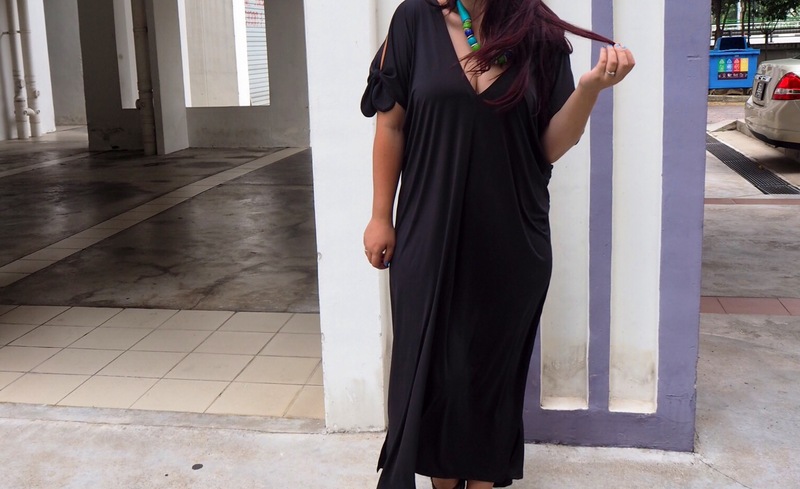 A simple pair of black sandals completed my look, as the afternoon I wore the dress in Singapore we were doing a lot of walking. A wedge would also look fabulous with the length of the dress. Bright lips and bold white vintage sunglasses added an “Emma element” to the outfit, because we all know how much I love a pop on the lip. Travel made easy, and stylish! If you need a little more convincing on why you need a Little Tanning Dress LBD in your wardrobe, check out how some of my favourite bloggers have styled the label. The gorgeous Beckie from Two Corporate Girls took her LBD on a recent beach weekend away, more here. For the tan lovers Jasmine at Pretty Chuffed shows us why this dress is so perfect for those tanning days – more here. 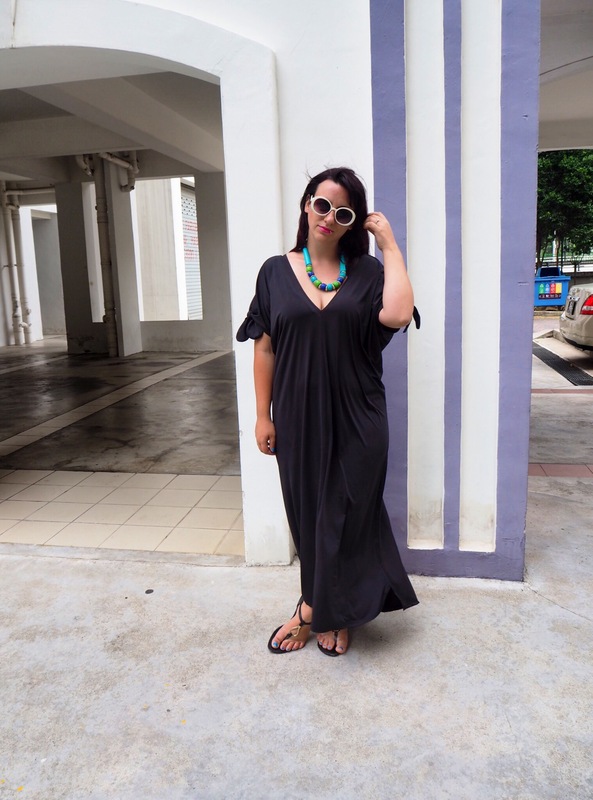 And the blogging queen herself Nikki from Styling You also loves Little Tanning Dress – more here. How do you rock an LBD? * Little Tanning Dress item gifted for my review. All opinions are my own. Well, what a great dress (with more than one use). Looks fabulous !! Perfect dress for travelling through warm climates . . . looks relaxed yet stylee. I know right. So easy to glam up too! That dress looks stunning on you Em – fake tan or not! And thanks so much for the Beckie mention. Thanks Bev! Beckie is absolutely killing it – go her!!! You must be a proud Mama! What a versatile dress! It does look perfect for travelling as well as tanning! That is a lovely maxi dress! Although I’m not a fake tanner, I agree that crease and wrinkle free dresses are the best – even when not travelling! Wash and wear things in my wardrobe get worn a lot more! Me too. This one is perfect for those lazy days too, it speaks for itself really!